Volume 44, Issue 2 (August 2013), pp. 115-117. Arkansas Review: A Journal of Delta Studies focuses on the seven-state Mississippi River Delta. The interdisciplinary journal is published three times a year by the Department of English & Philosophy, Arkansas State University. In 1946, a white, 24-year-old World War II veteran and his two brothers participated in a shootout at a gas station-turned-bar in Anguilla, Mississippi, killing two other veterans, both African American. Sixty years later, Molly Walling learned that her deceased father and her uncles reportedly were the assailants. Launching a search for the paper trail, Walling made multiple trips from North Carolina back to her ancestral Delta home. She visited courthouses and newspaper archives, interviewed friends and contacts, then friends of friends and contacts of contacts, always coming just short of incontrovertible evidence of her father’s role. Was he the one who pulled the trigger? Why did he and his brothers even go to the improvised bar? And why did they shoot Simon Toombs and David Jones? Multiple sources had their own theories, including her mother, a county attorney, an elderly eye witness, and her prickly aunt. But she found no substantive documentation. Charges had long been dropped, and the incident buried. 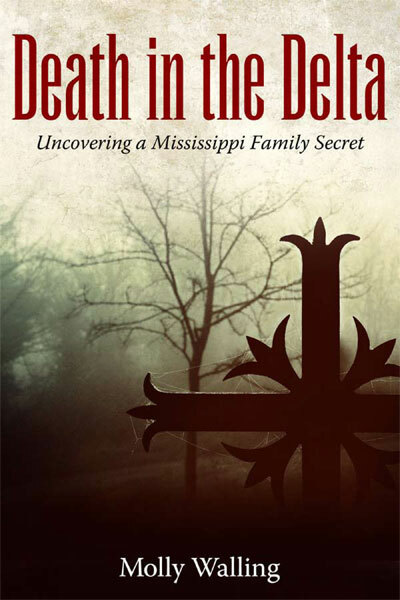 In Death in the Delta, Walling effectively weaves the mystery of the murders with childhood memories of her landed, extended family and erratic, alcoholic father, newspaperman Jay Fields, who could not maintain employment and moved his young family from Mississippi to Tennessee to Virginia. Driven by her love for him, Walling combed his articles and letters for clues to his troubled psyche, wondering whether guilt about the murders caused his self-destructive behaviors. Librarians, county employees, and relatives of the murdered men were open and helpful to her, while Walling’s family and friends tried to dissuade her, clammed up when she asked them about it, or were too intimidating to question at all. Wrestling with loyalty to family “honor” and the need to expose sixty-year-old truth, she chose a fine, difficult line between the two: “Let me be clear. It is not my intention to reinjure or denigrate anyone, but rather to tell you my story.” (p. xii) That’s laudable, as is forgiving long-past offenses. Her adored Mamaw, the revered and feared matriarch of Walling’s paternal family, would not have approved. “I struggled with the certainty that my writing about Dad, Bill, and Tom would make her very unhappy,” Walling says. “There would be no way for me to pursue this story were she still alive. I would not forsake her love.” (p. 118) But by admitting she would have sacrificed truth to avoid offense, Walling lets her own need take priority over the result she seeks: “If my beloved family and I can bear to look unflinchingly at our history and tell ourselves the truth and if we can allow ourselves to own our past and our human failings, there is hope for forgiveness, even reconciliation.” (p. 216) Unclear is whether Walling believes she has done so on her family’s behalf, or whether she is pleading with recalcitrant relatives to come along. Honor, especially in a family who still called their 1940s cotton farm a “plantation” (p. 3), is a loaded concept. In Southern Honor: Ethics and Behavior in the Old South (1982), Bertram Wyatt-Brown described white male dominance masquerading as honor as the “keystone of the slaveholding South’s morality” (Wyatt-Brown, p.vii). King Evans, the 93-year-old African American shootout witness, told Walling the Fields brothers went to the Pan Am bar to shut it down. “Your daddy thought he could just tell the customers to go home,” Evans said. “This is an example of ‘absolute power corrupting absolutely.’ Do you know what I mean?” (p. 56) Walling understands, but wishes she didn’t. By every measure, Mississippi ranked first in white-on-black violence and the impunity with which perpetrators carried it out. Pointed statistics about lynching, poverty, and education, and more about the dramatically oppressive sharecropping system would have given readers a better historical framework for the story. Ancestors like Walling’s are expertly examined in Kristina DuRocher’s Raising Racists: The Socialization of White Children in the Jim Crow South (2011). Rather than drowning his guilt with alcohol, as Walling postulates, her father may have been a product of his white supremacist upbringing, too weak to overcome it. Memoir writers can convey insights inherently unavailable to them as children. In an interview on her website, Walling says she avoided offering conclusions so readers could draw their own. But of a childhood domestic servant she says, “the thought of Azurine’s round, black body in the kitchen was reassuring” (p. 141). The description leaps from the page in ugly relief. Standing before the dilapidated site of the Pan Am bar while researching the murders, Walling says, she underwent a racial epiphany. One wonders why, then, she let her memory of the servant stand without comment. By not leading us toward her conclusions, she surrenders power as writer-narrator, letting readers define her in her own story. Walling could have delved deeper into privileges of skin color and resulting attitudes, including miscegenation. The last of these may well have been a factor in the murders, though she shies away from it. She credits others “who have tackled the issue of black/white relations” (p. 219), but absent are giants Lillian Smith, Katharine DuPre Lumpkin, and Larry L. King. Dubbed “The White Southern Racial Conversion Narrative” by Fred Hobson in But Now I See (1999), the hard examinations of their Southern backgrounds do not shrink from firm criticism, however tempered with love. Without proof of her father’s role, Walling must come to terms with another probable though gigantic fault in an already deeply flawed man. She lands on the side of love and forgiveness, but not without cost. By the telling, she has alienated loved ones. By walking the line between love and a clearer indictment of entrenched racism, she leaves readers without a fuller understanding of the potent effects of a Lost Cause heritage. No one doubts the difficulty of Walling’s undertaking. She joins the increasing ranks of whites scrutinizing their families and backgrounds, with an eye toward racial justice. Some examinations will be harsher than others, but all are worthy undertakings. It’s about time.